You might wish to attend “Raging Skillet” just a little bit hungry. Why? 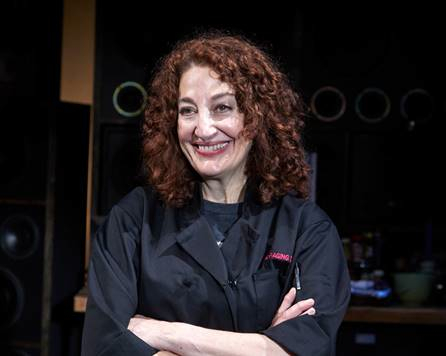 This semi-biographical play, subtitled “The True-Life Adventures of a Punk Rock Caterer,” not only serves up lots of laughs, but actual food to many in its audience. In fact, the sizzling logo of the play is crisp bacon in the design of the Jewish Star of David. That item, like many others throughout the story, is passed among the “guests,” only this time as a special treat dipped in chocolate. Like a restaurant menu, “Raging Skillet” offers something different for each person to enjoy. Based on the career of Chef Rossi and her recipe book/memoir, area playwright Jacques Lamarre gives Rossi heart and warmth as a woman attempting to learn, then survive, and ultimately succeed in a very difficult career. What keeps this somewhat oddball gal working are two things: humor (often self-deprecating) and loud rock music. Situated in a studio kitchen – picture Rachel Ray without the exhausting cuteness – Dana Smith-Croll (Rossi) speaks directly to her audience at first. The actress creates a brassy, no nonsense, somewhat world-weary, humorous woman. Her initial one-dimensional personality soon changes as she interacts with her long-time departed mother who returns for an unwanted visit. The reincarnation of Marilyn Sokol (Jewish mom) sparks a repartee of anecdotes, one-liners, and sweet walks/talks down memory lane for both women. In a smaller role, George Salazar (DJ) dishes up the amps while playing Rossi’s confidante/wait staff. Each actor comes with enthusiasm and energy. Smith-Croll’s makes her role (roll?) look easy. However, cooking up various foods in a real on-set kitchen, and at the same time delivering lines, is far from simple. Director John Simpkins arranges people and props onstage so that dialog and noshes are both delicious. The biography is strewn with Yiddish jargon; some common to anyone who has ever been to a bar mitzvah and/or New York City, others a bit more obscure. While I “got” them all, I wondered if some people in the audience could appreciate the slang. There is no skimping on set designer Michael Schweikardt’s large kitchen – if only that was my kitchen. As mentioned, music is a prominent component; Julian Evans is an accomplished sound designer. Note: Please, for the sake of your neighbors in adjacent seats, the actors onstage, and the many who have worked hard to create theatre – do NOT talk during the performance.